With Manhattan's retail sector catching the proverbial fire in the last couple of years, the city has seen an influx of new firms emerging and significant growth of tenured firms' retail arms. Adam Pincus at The Real Deal describes in his article (below) who's playing and how much. Even as firms consolidate in New York City’s commercial brokerage industry, the subset of Manhattan retail is growing increasingly fractured as more players try to get a piece of the ever-hot market sector. Indeed, The Real Deal identified more than 50 companies actively involved in third-party retail brokerage in Manhattan — some with deep brokerage roots here, and others that have only launched in the last few years. “Retail is the hottest sector,” said Jeffrey Roseman executive vice president at Newmark Grubb Knight Frank Retail. That strength is encouraging firms to open retail divisions and individuals to join the fray. “There are a lot of people chasing it, like in any business or industry when it is a good time,” he said. 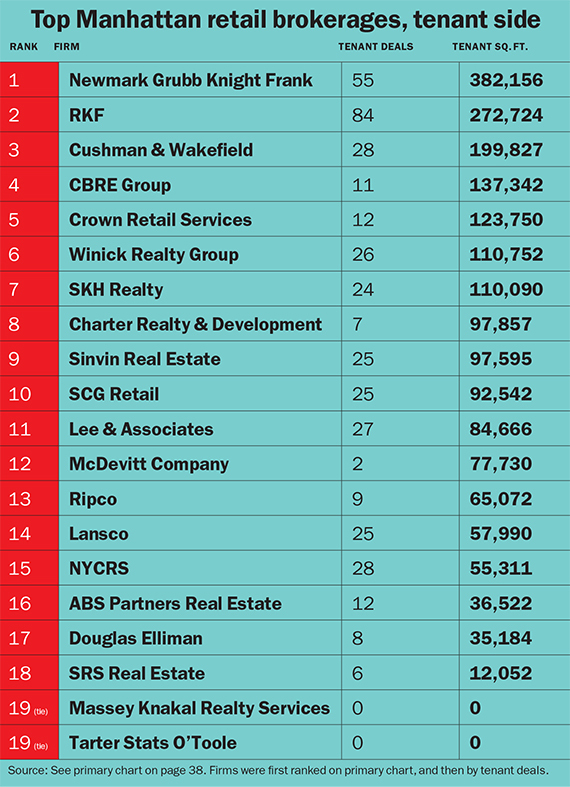 This month, to get a handle on the rapidly changing Manhattan sector, TRD ranked the big retail firms by number of square feet brokered. To do so, we compiled a list of more than 850 new and renewal lease transactions in Manhattan from 125th Street and south that were completed in 2013. The deals totaled nearly 3.5 million square feet. With no reliable public or industry-wide database of retail leases, we assembled data from CoStar Group and CompStak as well as from firms and news reports. As a result, firms that did not cooperate were likely undercounted, and some yet-to-be publicly announced deals at destinations like the World Trade Center and Brookfield Place were not included. 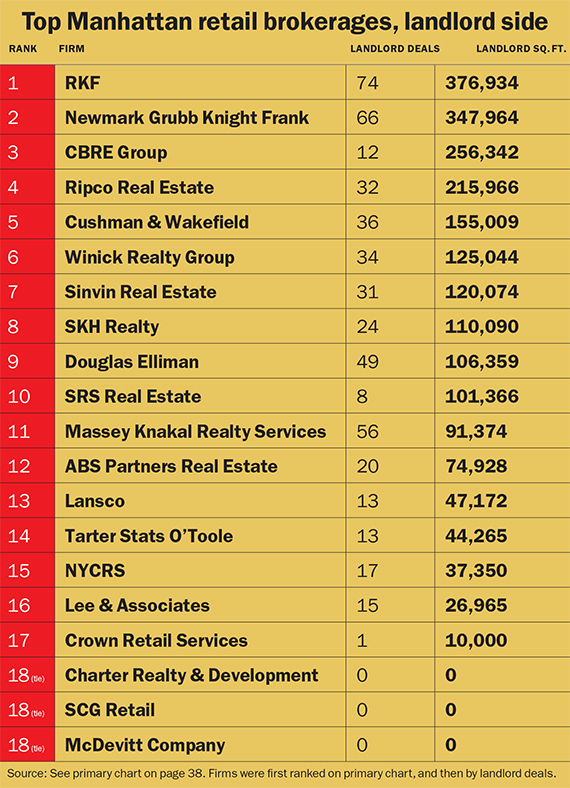 Nonetheless, TRD’s exclusive figures, which we last compiled in 2012 as the retail sector was ramping up, showed that in 2013 Newmark Grubb Knight Frank remained at the top in terms of square footage leased, with more than 696,000 square feet and 113 deals. The firm was followed by RKF, which had more deals (134), but only 591,412 square feet. Following on the heels of those brokerages were CBRE Group (nearly 394,000 square feet), Cushman & Wakefield (nearly 353,000 square feet), Ripco Real Estate (about 261,000 square feet) and Winick Realty Group (about 231,000 square feet). None of the top six firms cooperated; however, TRD was able to identify more of Newmark and RKF’s deals through industry sources. While the top of the list looks similar to TRD’s last retail ranking, a lot has changed since 2012. New on the scene A number of new players in the New York retail sector, including some who were just getting off the ground in Manhattan in 2012, have now cracked the top firms list. Those brokerages include Crown Retail Services, Massey Knakal Realty Services and Charter Realty & Development. Crown, the brokerage arm of the Chera family’s Crown Acquisitions, did 12 deals in the borough south of 125th Street, totaling more than 123,000 square feet and ranking ninth onTRD’s list. The company was founded in January 2010 (see “The Syrian retail touch”). Meanwhile, Lee & Associates, which launched in Manhattan in 2011, had nearly 99,000 square feet and 35 deals, placing it 13th in the ranking. 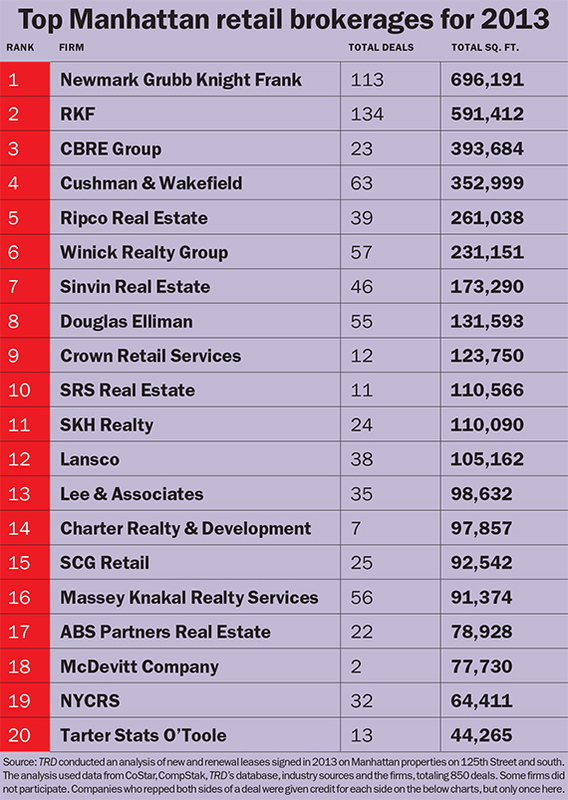 Charter Realty & Development, which is based in Connecticut, completed about 98,000 square feet of transaction through seven deals, ranking 14th. (It handled a handful of major deals for discount gym Blink Fitness.) In addition, Massey Knakal — a major player in the investment sales arena, which only entered the retail fray in January 2011 — has carved out a strong book of business in only two short years. The company’s retail division, which is headed by Ben Fox, brokered 56 deals in 2013, totaling 91,347 square feet and placing it 16th on our ranking. Other firms did not make the cut in 2013, but industry sources said they deserve to be watched in 2014. For example, TRD did not identify any Manhattan deals completed last year by Dallas-based Open Realty Advisors, which represents tech giant Apple, but retail sources said they expect the firm to sign a deal for a Brooklyn location this year. Also, long-time investment sales firm Eastern Consolidated launched a retail leasing division at the end of 2013. That company just lured James Famularo, an active broker with NY Commercial Realty Services, to help jump-start the new leasing division along with several other leasing brokers. A few smaller firms that did not make the list each completed more than 30,000 square feet of deals, including Midtown-based Kassin Sabbagh Realty and PD Properties ‘Healthy’ market One major theme for last year was health and fitness. Indeed, several of 2013’s largest deals were inked by health clubs (see “Retail’s ‘crystal ceiling’”), including: three from Blink Fitness; four from Planet Fitness, and deals from New York Health & Racquet Club, Equinox and others. In fact, gym deals accounted for more than 281,000 square feet of the top 40 deals, which totaled about 1 million square feet. “The health and fitness section was enormously active this past year, and I see that continuing into 2014,” said Peter Levine, a retail broker with Charter Realty & Development, who represented Blink in its three Manhattan leases. “You will probably see a greater numbers of deals [this] year.” Since health clubs can only open in areas with special zoning, there is often more than one gym vying for the same spot, Levine said. Planet Fitness, a chain of discount gyms represented by Crown, signed four deals in Manhattan south of 125th Street, for a total of more than 89,000 square feet, including at 423 West 55th Street in Hell’s Kitchen and at 25 Broadway Downtown. Organic, vegetarian and vegan restaurants were also hot tenants in 2013, insiders said — although those firms took smaller spaces. For example, Lyfe Kitchen, a health-food restaurant that focuses on sustainable and locally sourced food, inked a deal in January for just over 3,400 square feet at the base of Boston Properties’ new tower at 250 West 55th Street. Other health-food chains that expanded in New York last year were Dig Inn, Chickpea, and Little Beets. Meanwhile, Santa Monica, Calif.-based Veggie Grill is hunting for space here, insiders said. Full-service healthy restaurants are also expanding. For example, the popular East Village vegetarian restaurant Dirt Candy inked a lease for a larger space, at 86 Allen Street, for about 2,600 square feet. Some said that both these trendy healthful retailers and the new retail brokers would not all survive. “But like anything else — like the [frozen] yogurt business or the hamburger business — it will sort of condense, and the cream always rises,” Newmark’s Roseman said.